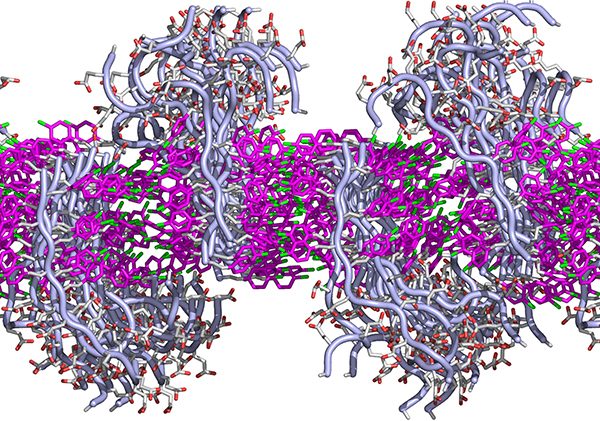 This simulated cross-section shows how the lipid-like peptoids interact to form a membrane. Each peptoid has two sections: a fatty-like region that interacts via benzene rings (shown in pink) with its neighbors to form a sheet. And a water-loving region that juts above or below the flat sheet. Each region can be designed to have specific functions. Enlarge image. Materials scientists have created a new material that performs like a cell membrane found in nature. Such a material has long been sought for applications as varied as water purification and drug delivery. Referred to as a lipid-like peptoid (we'll unpack that in a second), the material can assemble itself into a sheet thinner, but more stable, than a soap bubble, the researchers report this week in Nature Communications. The assembled sheet can withstand being submerged in a variety of liquids and can even repair itself after damage. "Nature is very smart. Researchers are trying to make biomimetic membranes that are stable and have certain desired properties of cell membranes," said chemist Chun-Long Chen at the Department of Energy's Pacific Northwest National Laboratory. "We believe these materials have potential in water filters, sensors, drug delivery and especially fuel cells or other energy applications." Why It Matters: Cell membranes are amazing materials. Made from thin sheets of fatty molecules called lipids, they are at least ten times thinner than an iridescent soap bubble and yet allow cells to collectively form organisms as diverse at bacteria, trees and people. Cell membranes are very selective about what they let pass through, using tiny embedded proteins as gatekeepers. Membranes repair dings to their structure automatically and change thickness to pass signals from the outside environment to the cell's interior, where most of the action is. Scientists would like to take advantage of membrane properties such as gatekeeping to make filters or signaling to make sensors. A cell-membrane-like material would have advantages over other thin materials such as graphene. For example, mimicking a cell membrane's efficient gatekeeping could result in water purifying membranes that don't require a lot of pressure or energy to push the water through. Methods: Synthetic molecules called peptoids have caught the interest of researchers because they are cheap, versatile and customizable. They are like natural proteins, including those that embed themselves in cell membranes, and can be designed to have very specific forms and functions. So Chen and colleagues decided to see if they could design peptoids to make them more lipid-like. The lipid-like peptoids spontaneously form sheets (yellow) in solution, as seen in a high-resolution microscope. Enlarge image. Designing membranes. Lipid molecules are long and mostly straight: They have a fatty end that prefers to hang out with other fats, and a water-like end that prefers the comfort of water. Because of this chemistry, lipid molecules arrange themselves with the fatty ends pointed toward each other, sandwiched between the water-loving ends pointed out. Scientists call this a lipid bilayer, essentially a sheet that envelops the contents of a cell. Proteins or carbohydrate molecules embed themselves in the membranous sheet. Inspired by this, Chen and colleagues designed peptoids in which each base peptoid was a long molecule with one end water-loving and the other end fat-loving. They chose chemical features that they hoped would encourage the individual molecules to pack together. They examined the resulting structures using a variety of analysis methods, including some at the Advanced Light Source and the Molecular Foundry, two DOE Office of Science User Facilities at Lawrence Berkeley National Laboratory. The team found that after putting the lipid-like peptoids into a liquid solution, the molecules spontaneously crystallized and formed what the scientists call nanomembranes -- straight-edged sheets as thin as cell membranes -- floating in the beaker. These nanomembranes maintained their structure in water or alcohol, at different temperatures, in solutions with high or low pH, or high concentrations of salts, a feat that few cell membranes could accomplish. A view from the middle. To better understand the nanomembranes, the team simulated how single peptoid molecules interacted with each other using molecular dynamics software. The simulated peptoids formed a membrane reminiscent of a lipid bilayer: The fat-loving ends lined up in the middle, and their water-loving ends pointed outward either above or below. To test whether their synthetic membranes had the signaling ability of cell membranes, the researchers added a touch of sodium chloride salt. Salt is involved in the last step in many signaling sequences and causes real cell membranes to thicken up. And thicken up the peptoids did. The more salt the researchers added, the thicker the nanomembranes became, reaching about 125 percent of their original thickness in the range of salt concentrations they tested. Real membranes also hold proteins that have specific functions, such as ones that let water, and only water, through. Chen's group tested the ability of peptoids to do so by introducing a variety of side chains. Side chains are essentially small molecules of different shapes, sizes and chemical natures attached to the longer lipid-like peptoids. They tried 10 different designs. In each case, the peptoids assembled into the nanomembranes with the core structure remaining intact. The team could also build a carbohydrate into nanomembranes, showing the material can be designed to have versatile functions. Taken together, the results showed the researchers that they are on the right path to making synthetic cell membrane-like materials. However, there are still some challenges to be addressed for applications. For example, the researchers would like to better understand how the membranes form so they can make many desirable sizes. What's Next? The next step, Chen said, is to build biomimetic membranes by incorporating natural membrane proteins or other synthetic water channels such as carbon nanotubes into these sheet matrices. The team is also looking into ways to make the peptoid membranes conductive for energy uses. Sponsors: This work was primarily supported by the Materials Synthesis and Simulation Across Scales (MS3) Initiative through the Laboratory Directed Research and Development fund at Pacific Northwest National Laboratory (PNNL). In situ atomic force microscopy studies and molecular dynamics simulations were supported by the U.S. Department of Energy (DOE), Office of Science, Office of Basic Energy Sciences, Biomolecular Materials Program at PNNL. 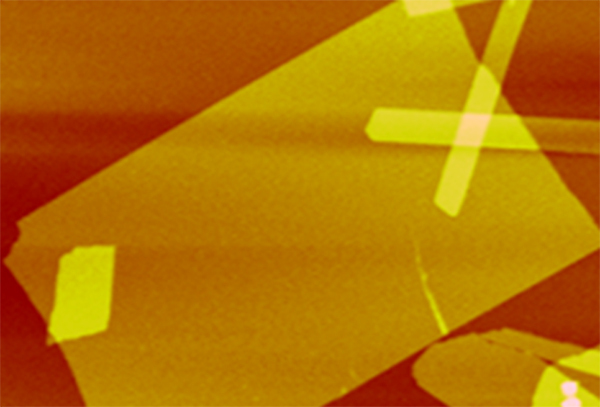 X-ray diffraction work was conducted at the Advanced Light Source with support from the Molecular Foundry, at the Lawrence Berkeley National Laboratory, both of which are supported by the DOE Office of Science. Peptoid synthesis was partially supported by the Defense Advanced Research Projects Agency Fold F(x) programme. F.J. gratefully acknowledges financial support from China Scholarship Council. Written by Mary Beckman as a press release for Pacific Northwest National Laboratory. 1-sentence summary: Materials scientists have created a new material that performs like a natural cell membrane. Such a material has long been sought for uses as varied as water purification and drug delivery. Referred to as a lipid-like peptoid, the material can assemble itself into a sheet thinner, but more stable, than a soap bubble. The assembled sheet can withstand being submerged in various liquids and can even repair itself after damage.